Following the meeting, a Congress delegation led by state party chief Ashok Chavan met Governor C Vidyasagar Rao and the demand was raised for providing similar reservations to the Muslims, the Dhangar (shepherd) community, the Mahadev Kolis, and the Lingayats. In the wake of the pro-reservation protest by the Maratha community in Maharashtra, the Opposition on Monday upped the ante against the Devendra Fadnavis government. But in the process, differences that exist within both the Congress and the NCP over the reservation issue came to light. To corner the government over the issue, both parties convened a meeting of their legislative wing on Monday. At the Congress meeting, MLAs belonging to the Maratha community raised the demand for a “collective resignation” of all party MLAs over the issue, but it was opposed by other legislators. Some of the non-Maratha MLAs also cautioned that pushing the reservation demand of the Maratha community alone may result in a political backlash from other communities, impacting the party’s prospects. During the Congress meeting, Leader of the Opposition Radhakrishna Vikhe-Patil was questioned by some senior MLAs on why the issue of reservations for Muslims had not been raised by the party during the group leader’s meeting. “We had provided reservations to the Muslim community during our reign. The current government has been deliberately delaying its implementation although the court has upheld the reservation,” said former state minister Naseem Khan. Incidentally, Vikhe-Patil had backed the demand for collective resignations of MLAs on the Maratha reservation issue, which was first raised by Pandharpur MLA Bharat Bhalke. The MLA had already offered to resign from the legislative Assembly over the issue. But with no consensus emerging over the issue, sources said the proposal will now be referred to the party’s high command. 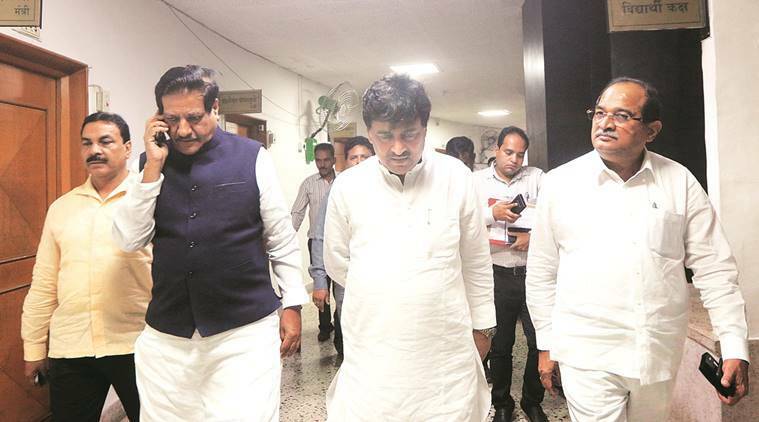 Chavan said during the meeting that he would discuss the matter with AICC Maharashtra in charge Mallikarjun Kharge, who is also the Leader of Opposition in the Lok Sabha. A former minister, who was not in favour of the resignation proposal, said the Speaker would readily accept the resignations of Congress MLAs. The leader asked if those resigning were prepared to face bypolls just ahead of the 2019 state elections. A proposal to offer resignations on a piece of paper without it being in the format prescribed by the state legislature was later discussed. Toeing the Congress’ line, the NCP also raised the demand for reservations to be extended to other communities, while backing the Maratha quota demand. Targeting the government over the delay in extending the reservations to the Marathas, the party said the state should adopt the Tamil Nadu model of reservations to ensure that it stands the legal test. While the Congress camp was also divided over meeting the Maharashtra State Backward Class Commission over the Maratha reservation demand, a delegation eventually met the commission chairman, replicating the pattern followed by both the BJP and the NCP. “The government should not test the patience of people. It must extend reservations to the Marathas, the Muslim, the Dhangars, Mahadev Kolis, and the Lingayats without impacting the existing reservation matrix,” Chavan said, while admitting to there being differences within the party over the mass resignation proposal.